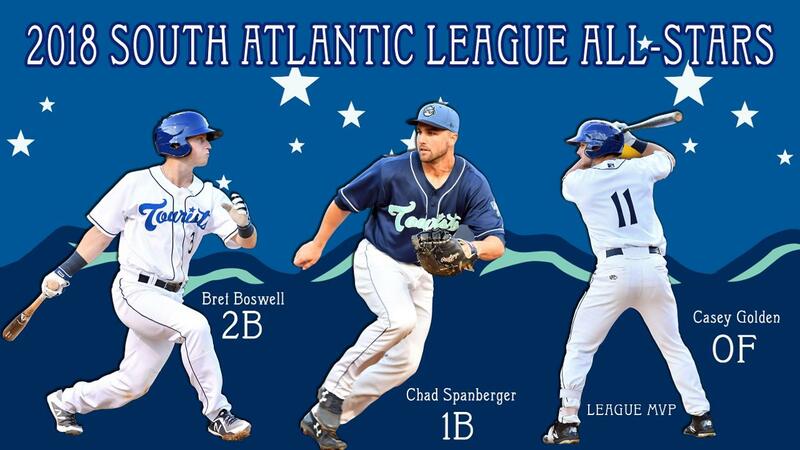 ASHEVILLE- The South Atlantic League revealed the 2018 End of the Year All-Star Team earlier today and the Asheville Tourists had a league-high three players selected. Casey Golden was named the 2018 South Atlantic League MVP and one of the three best outfielders. Chad Spanberger was voted as the league's top first-baseman. Bret Boswell was named the league's number one second-baseman. Golden is the second Tourists player to be named MVP of the South Atlantic League over the last three seasons. Brian Mundell took home the league's most prestigious honor in 2016. The Siler City, NC native is currently first in the circuit in Home Runs (32), first in RBI (90), first in runs scored (86), first in extra-base hits (57), and first in total bases (246). The former UNC Wilmington Seahawk is also second in slugging percentage (.563) and eighth in batting average (.279). Casey Golden is only the 13th player in Asheville professional baseball history to reach the 30 Home Run mark in a season and is the first to do so since Corey Dickerson in 2011. Golden is currently tied for 6th on the all-time Asheville Home Run list. In addition, Golden has 23 stolen bases making him the only player in the SAL to be a member of the 20-20 club. Chad Spanberger appeared in 92 games for the Tourists before he was traded to the Toronto Blue Jays organization. Spanberger still leads the league in in batting average (.315) and slugging percentage (.579), ranks second in RBI (75), third in Home Runs (22), fourth in total bases (202), and fifth in on-base percentage (.363). The former Arkansas Razorback was considered a candidate to win the triple crown prior to his departure from the South Atlantic League on July 26. Bret Boswell appeared in 97 games with the Tourists before receiving a promotion to High-A Lancaster. Boswell hit .288 which currently ranks as the league's fifth best batting average. The former Texas Longhorn clubbed 17 Home Runs and drove in 50. His 69 runs scored led the league at the time of his promotion to the California League. A full list of the 2018 End of the Year SAL All-Star selections can be found here. The Asheville Tourists wrap up the regular season with a four-game series at McCormick Field that begins on Friday, August 31st.